Kenya is set to boost its power sector and reduce the cost of electricity with the completion of a 280Megawatts (MW) Olkaria I and IV geothermal power plants, Cabinet Secretary for Energy and Petroleum Davis Chirchir said. 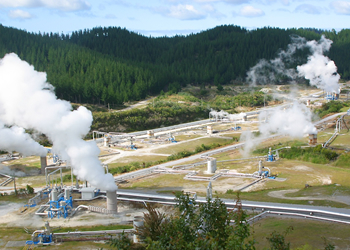 The Olkaria I and IV geothermal plants which will generate about 140 MW each, is scheduled to be commissioned in February according to report. While producing electricity with geothermal steam is cheaper, the plants will lead to a sharp reduction in the cost of electricity by increasing competition in the power industry, Chirchir told local reporters at the project site in Olkaria region of Kenya. “These two projects will further boost competitiveness in Kenya’s power sector,” and is part of the government’s strategy to lower electricity cost to as low as Sh6 per kilowatt from the current Sh16, CapitalFm quoted Chirchir as saying. The East African country is presently embarking on an ambitious plan to boost power production capacity from the current 1712MW to 5000MW and is relying on low cost sources like geothermal and wind power to achieve the goal. The Olkaria geothermal-active region in Kenya is used to produce large quantities of clean electrical power and has a potential of 2,000 MW. According to Chirchir, Kenya will build three more plants in Olkaria V, VI and VII sites soon to generate an additional 350 MWatts of geothermal power.